What to see there? Sabah is located on the Northern part of Borneo and makes up one part of East Malaysia alongside Sarawak. It is surrounded by the South China Sea to the west, Sulu Sea in the northwest Sulu Sea in the northeast and Celebes Sea in the southeast. Capital city KK is undergoing a regeneration, luring expats with swanky condos and swathes of new malls all nestled on a sun bathed waterfront. Old KK on the other hand, with its fresh seafood markets, awesome streetfood and warm banter from the local fisherman - will charm you with its rustic presence amidst a growing developing compact city. There's a number wildlife or diving adventures to choose from, the only limit would be one's stamina! The Sepilok Orang Utan Rehabilitation Centre in Sandakan is a must visit as the centre is the first official orangutan rehabilitation project for rescued orphaned baby orangutans. Today, it has an estimated 60-80 orangutans living in the reserve where visitors can meet, feed and play with them! The Crocker Range National is the largest in the state consisting of hilly and mountainous forests and serves as a water catchment to supply fresh water to the towns in Sabah. Then, there's Kinabalu National Park which was accorded Unesco World Heritage Site in 2000 for being one of the most important biological sites in the world with more than 4,500 species of flora and fauna, including 326 bird and around 100 mammal species and over 110 land snail species! 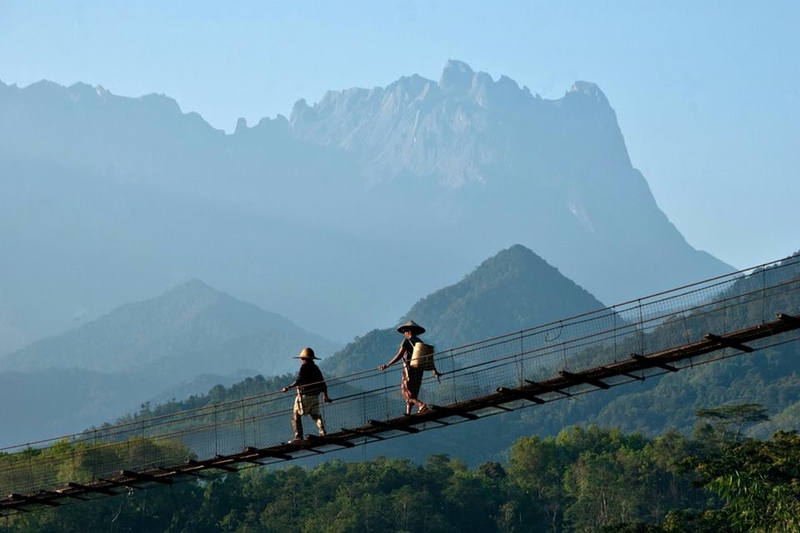 It is also home to the legendary Mount Kinabalu which at 4,095.2 metres is the highest peak on the isle of Borneo. If you fancy a break from the wildlife and the dense greenery, Sabah has a number of Marine Parks and Islands with emerald greenwaters and stunning sunsets. There's Tiga Island National Park that is made up of Kalampunian Besar & Kalampunian Damit - which is renowned for its therapeutic mudbath. Tunku Abdul Rahman National Park which consists of five islands - Gaya, Manukan, Mamutik, Sapi and Sulug are all accessible via ferry Jesselton Point Ferry Terminal in downtown Kota Kinabalu. Choose from a number of resorts to stay in, with accommodation ranging from cheap to really extravagant!It is also important to note that the three largest indigenous group in Sabah are mainly Kadazan-Dusun, Bajau and Murut; followed by the Bruneian Malays, Suluk and other indigenous population while the Chinese makes up the main non-indigenous population. So expect a different kind of melting pot compared to the one in the Peninsular, although rest assured the warmth and the charm of its people in their surroundings will continue to grab at heartstrings! Sabah is blessed with diverse natural beauty that is unique to this part of the world. It's capital city Kota Kinabalu (KK for short) will captivate you with its super friendly locals, burgeoning arts & music scene, breathtaking sunsets and rich cuisine!